Schematic diagram of the single photon detector. The photon is represented by the wavy multi-colored line and the red dot represents the quantum dot. FAYETTEVILLE, Ark. 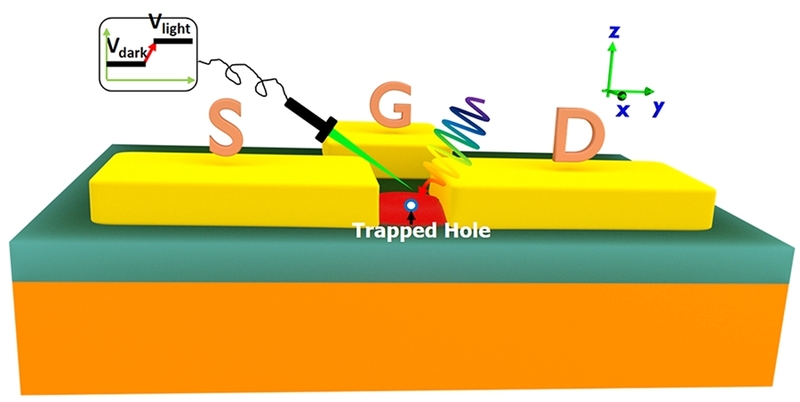 – A team of researchers including U of A engineering and physics faculty has developed a new method of detecting single photons, or light particles, using quantum dots. Shui-Qing “Fisher” Yu, associate professor of electrical engineering; Greg Salamo, distinguished professor of physics; and Yang Zhang, a post-doctoral fellow in electrical engineering at the time, worked with colleagues from Dartmouth and the University of Wisconsin on this research, which was recently published by ACS Photonics. Yu compared this to adding a drop of water to a container. “If you put one drop of water in a large tank, that change is hard to see,” he said. “But if you put a drop of water into a very small container, you can see the change more easily.” In the researchers’ design, the electron is in a small container – the quantum dot.